With the advent of special high efficiency low voltage DC LED or Compact Fluorescent lighting from OnSolar.co.uk, it is possible to install powerful low energy 12v (or 24V) lighting almost anywhere including your stable block or barn! One of the most gratifying things a remote stabling operator / owner can do is to install a simple 12v DC lighting system. This will transform the time spent there by virtue of providing good quality powerful lighting to cover safety and practicality. 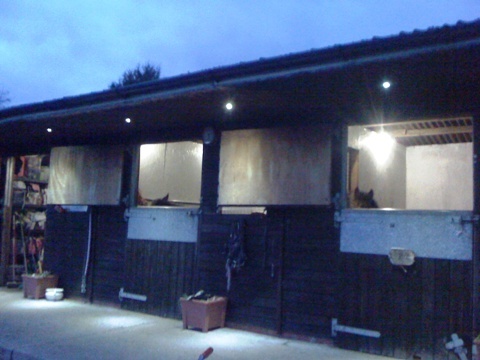 Lighting your stable block will allow maintenance routines to be carried out throughout the year in complete safety. It is amazing the difference even a couple of well placed low energy fluorescent lamps can make. 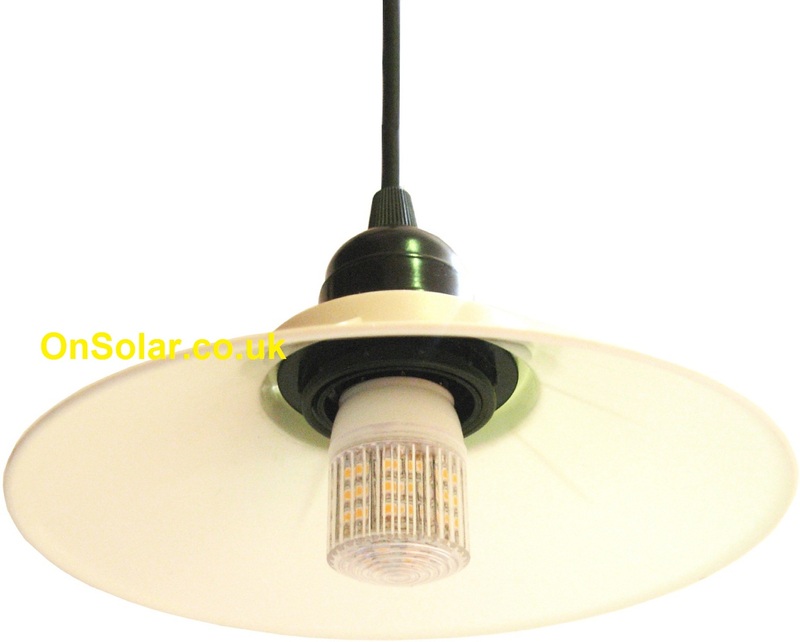 A small 12v 3 Watt LED Pendant Stable lighting unit with a 7 inch reflector adds a nice retro touch and will provide excellent illumination similar to a regular 40 watt incandescent lamp, so as you can see, this is going to be Very useful light! For some horse and pony owners, it can be a little disconcerting to be working perhaps a mile of more from the nearest homestead and perhaps in failing light conditions. Of course one will have a reliable torch to help guide the way. However, wouldn’t it be a lot better if the areas you need to work in were brightly lit? Of course it would, but How? Take a look at the diagram further down below in this article. It is relatively easy for anyone to install a simple lighting circuit but we would also like to point out that this should not be undertaken as a spur of the moment project; one should make sure that all components are fit for purpose, safe and that suitably rated fuse is installed to protect against short circuits. It is also prudent to ensure any cabling is installed so that animals cannot gain access to it. Depending on how you feel about it, you may also wish to install a ‘Car radio’ (yes this does not need to be in a car) to provide some company for yourself and your animal(s). You can then tune into some tasteful music whilst your are grooming your horse for example. As the diagram below illustrates, for installations requiring long cable runs, there may be a slight voltage drop as power reaches the final or last lamp in a chain but providing quality cabling is used and the length is not too long, there should not be any problems. If volts amps and watts are not your bag, don’t worry we just recommend using good quality 2 core (or 3 core but no need to use the earth wire) rated for household extension lead duty minimum. The voltage drop may cause lamps at the end of long ‘thin’ wiring installations to be a little dimmer. It is not desirable to allow voltage to drop below around 11.5v as this actually increases loading and may shorten compact fluorescent lamp life or just make LED bulbs appear a little dimmer (although most of our led bulbs are fine all the way down to 11v or even lower). This can be offset by employing a double cable run or using a higher grade / higher amperage cable. You may also be able to locate any larger lamps you may intend to use at the start of the circuit / closer to the battery or on a separate circuit. You may also employ smaller 7W or 3W lamps towards the end or in ‘last position’ in your lighting circuit. 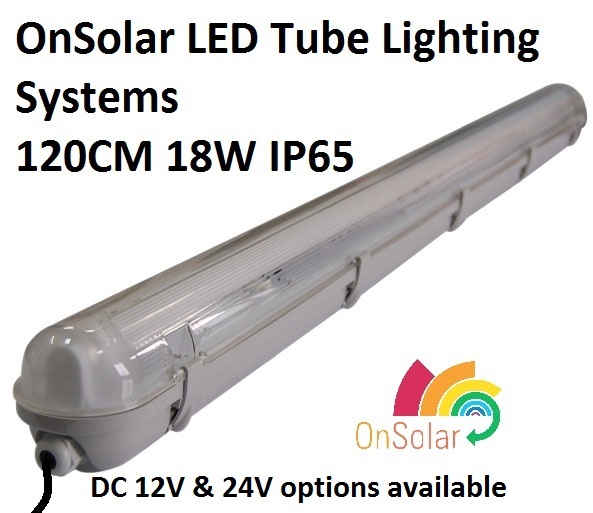 For a larger, brighter solution to your stable lighting requirements OnSolar can now offer 12V and 24V DC 18W 120cm / 4 foot tube lighting systems. These are suitable for damp locations with a very high IP65 rating to prevent damage in damp or outdoor conditions. Contact us if you require such or are interested in this type of lighting system. Another great thing one can have is the ability to operate ones stable lighting via a remote control. This may not turn on the interior lighting but maybe a couple of outside lights. This can prepare the way and provide security as one will be able to see there are no unwelcome visitors lurking or suspicious looking activity. See 12v remote ‘key fob’ operated switches on the OnSolar Specials page. Alternatively, one can install a fabulous quality motion detector to instantly turn on your exterior lighting circuit and provide illumination as you approach. The above example is only an example. If you wish to use alternative more powerful lighting higher grade cable will be required in a similar fitting. Unless using multiple cable runs, one should not exceed the recommended maximum amperage for the chosen cabling. A 7 watt CCFL lamp can be considered as using around .6 of an amp so using four will equal around 2.5 amps which will be just fine for an average application with up to around 20 meters of distributing cabling. Regular domestic 2.5mm ‘twin & earth’ from a local DIY store will be just fine. However, one may need to consider damage from rodents and of course be sure to install a simple car style blade fuse of say 5 amps (in the example here). 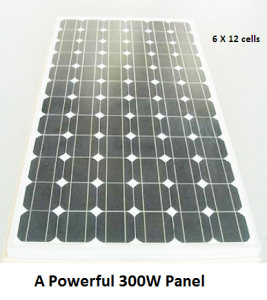 If at all possible and your site does not suffer from strong shading from trees, it is of huge benefit to install a solar PV panel of around 40 watts (or more preferably) to keep your battery in good health and to ensure power is available at all times (especially during the winter months). Of course, if you were planning to be a little more extravagant and use more or larger lamps than in the illustration above, one would require a larger PV (photovoltaic panel) of perhaps 80 watts minimum, perhaps two or three hundred watts assuming an hour or two each evening using your lighting circuit and maybe other devices such as your laptop, audio equipment or even led floodlighting perhaps to illuminate the menage, etc. If you have a particular scenario that you would like to employ low voltage low energy lighting into and want to seek advice first, please go ahead and drop us an email, see below.